Are you looking for a luxury apartment with the perfect floorplan? One that augments your lifestyle, rather than upending it? Steel Works offers no-fee apartments in Harrison with a range of layouts to select from. Join us for a typically perfect day and experience it for yourself. Wake up and pull back the blinds in your lofty master bedroom — elevated 9-foot-tall ceilings and all—bathed in natural light. This morning, you’re in the driver’s seat and Harrison’s Riverbend District is your racetrack, but slow and steady wins the race, so you decide to take some time for yourself before heading out. Your master bathroom is your sanctuary; luxuriate under your rainfall showerhead while admiring sleek gray and white fixtures and finishes through your shower’s frameless glass door. Once you’re toweled off and feeling refreshed, design today’s look from inside your custom modular walk-in closet. Having completed your morning routine, head into the open-layout kitchen. On your way, queue up your favorite playlist in your apartment’s pre-wired audio system – or throw on tunes by New Jersey’s musical legends. You can’t go wrong with The Boss, but Harrison and surrounding towns also produced greats like Whitney Houston, Lauryn Hill, Akon, Donald Fagen of Steely Dan, and Yo La Tengo. At Steel Works, the sky is the limit for your culinary potential. 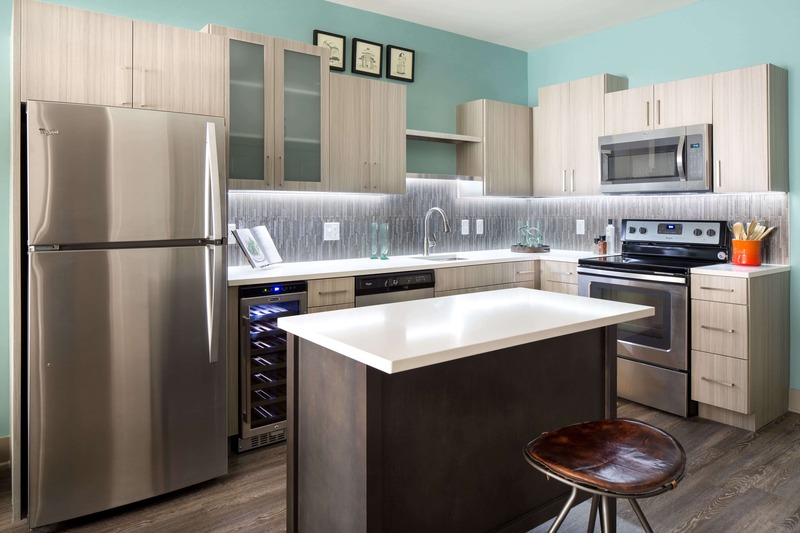 Your spacious kitchen features stainless steel Energy Star appliances and quartz countertops, with ample storage thanks to designer cabinets and your own wine fridge. A movable chef’s island lets you indulge your more ambitious side by providing all the prep space you could ever need, while providing you with the flexibility to entertain. So, even if you’re making oatmeal for breakfast this morning, you’ll enjoy making it like you never have before. Let’s pretend for a minute that you’ve already explored everything that Steel Works’ neighborhood has to offer – that you’ve already taken in an MLS game at Red Bull Arena, visited the GRAMMY Museum, and spent an afternoon at West Hudson Park – and decide that, rather than venturing out into Harrison, you feel like taking it easy. For residents of Steel Works’ no-fee Harrison apartment rentals, sometimes the best course of action is to spend the weekend taking advantage of each and every on-site amenity. Head down to the state-of-the-art fitness center and try our WELLBEATS™ virtual workout classes, or push yourself in our best-in-class spin room. Or, if you’re in more of a lounging mood, knock out a few chapters of your latest literary obsession at our private pool deck, and then post up on the rooftop with a cold drink. There’s no better place to recharge after a long week than right here at home. After a rigorous day of relaxation, there is nothing like returning home to your apartment. Select a perfectly-chilled Sancerre from your personal wine fridge, indulge yourself and guests with a most generous pour, and step out onto your private balcony to take in the sunset. Just before bedtime, allow yourself a soak in the tub—then it’s back into the soft folds of your bed. If this all seems too good to be true, rest assured; Steel Works has every feature and amenity that you need to live your best life. All that remains is to decide which of our gracious apartment layouts is right for you. Check out each of our available floorplans and make the Steel Works lifestyle your own. Come visit us and inquire about our new incentives.